Horse Colic, acute stomach pain, is the number-one killer of horses and can be a really serious problem. Call your vet immediately when you suspect colic and begin emergency first aid. Your horse can suffer from a wide variety of injuries and ailments, but colic is the most common winter health hazard for horses. Make sure you know how to prevent it, how to spot it and what to do about it. Equine colic, or horse colic, is abdominal pain ie; pain in your horses gut. However, there are many causes of colic some of which can be mild while others can be life threatening. In the early stages of colic it’s never possible to tell how severe it is and so, all cases should be treated seriously and you should consult your vet immediately. Colic usually involves the impaction or obstruction of the gastrointestinal tract. Poor quality hay and inadequate water intake contribute to the formation of intestinal compactions. Intestinal obstructions may be worsened by the accumulation of intestinal gas and a loss of smooth muscular contraction. 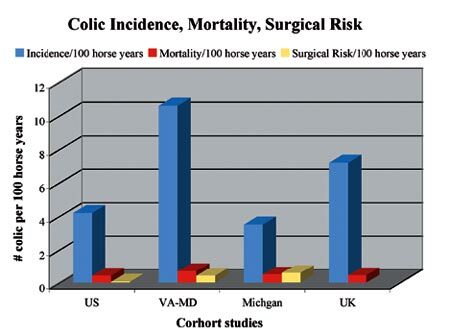 The attached graph shows the results of studies on U.K. horses and horses in the U.S.A, horses in the Virginia-Maryland region and in Michigan, based on incidence, mortality, and surgical risk per 100 horses per year. Colic can be caused by a variety of circumstances including an abrupt change in feeding practices, over-feeding, worms or other parasites, poor feed quality, dehydration, eating sand, a twisted intestine and pregnancy. This is the term used when the intestine becomes blocked by a firm mass of food. Impactions most commonly occur in the large intestine at one of the flexures. This is a fairly common type of colic which usually resolves relatively easily with appropriate treatment. However, an impaction may be just the first obvious sign in a more complicated case. Some cases of colic are due to increased intestinal contractions, the abnormal spasms cause the intestines to contract painfully. These cases usually respond fairly well. In a displacement, a portion of the intestine has moved to an abnormal position in the abdomen. A volvulvus or torsion occurs when a piece of the intestine twists. The suspension of the small intestine from the mesentery (the net curtain) and the unfixed nature of much of the large intestine predispose horses to intestinal displacements and torsions. Except in rare cases, these types of colic cause a total blockage of the intestine and require immediate surgery if the horse is to survive. In the early stages of a displacement/torsion colic, the signs may be similar to those of a horse with one of the more benign causes of colic. That is why it is important to take all cases of colic seriously, and to seek veterinary advice at an early stage. Sometimes gas builds up in the intestine, most commonly in the large intestine and/or caecum. The gas stretches the intestine, causing pain. Gas colics usually resolve fairly easily with appropriate treatment, although it is essential to ensure that there is no underlying reason for the problem. Some cases of abdominal pain are due to inflammation of the small (enteritis) or large (colitis) intestines. These are serious medical cases and require immediate veterinary attention. When a horse gorges itself on grain or, even more seriously, a substance which expands when dampened like dried beet pulp, the contents of the stomach can swell. 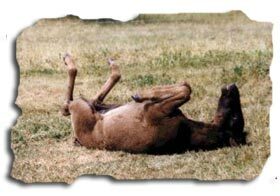 The horse’s small stomach and its inability to vomit mean that in these circumstances the stomach may burst. Once this has happened death is inevitable. 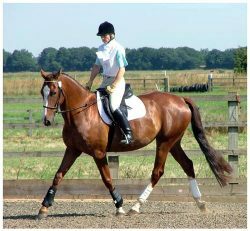 If you suspect that your horse may have gorged itself on concentrated feeds, seek veterinary advice immediately. In many cases of colic it is impossible to determine the reason for the pain. Symptomatic treatment, close monitoring and attention to any adverse developments usually lead to resolution of the problem. Do not miss buy cheap actonel any doses..